A mobile room divider with locking castors which can be used as a mobile partition or as a mobile display board. The double sided panels are covered in fire retardant felt which can be used with pins and velcro. Choose from 4 colours - red, green, blue and grey. 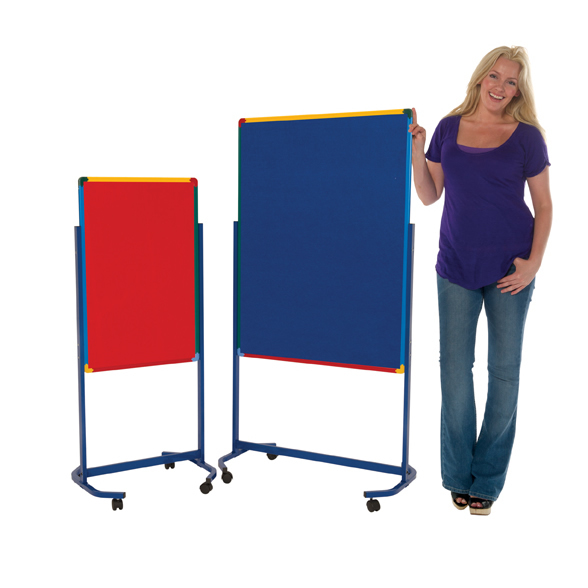 With a bright Harlequin colour-mixed frame and rounded safety corners this partition is great for classrooms in schools and nurseries. Our image shows the partition in the high position but the panel can be flipped and re-attached to the frame in a low position to give 210mm of height adjustment. View our full range of Mobile Noticeboards.